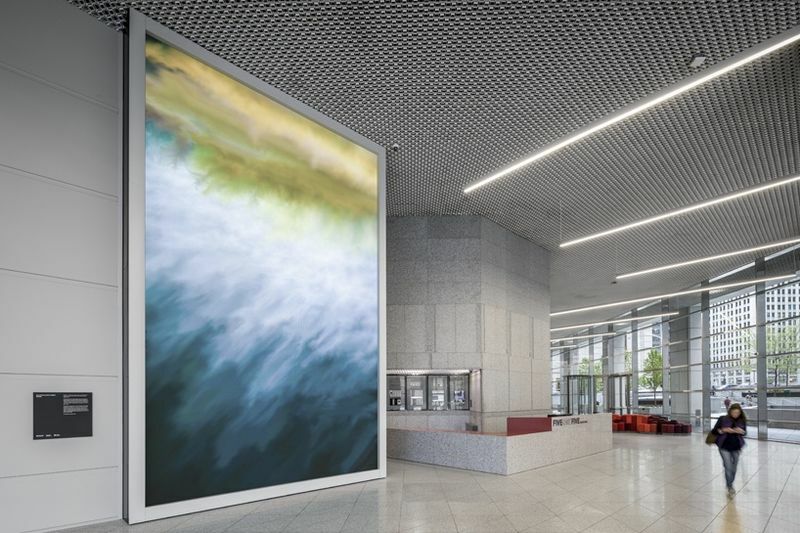 Recently, artists from ESI Design were tasked with creating a new experience in the vast, gallery-like lobby of 515 North State St, Chicago. They didn't want to play on the typical old-school approach of installing an abstract painting though, instead, they created a unique 14-foot-wide by 23-foot-tall digital art installation that constantly 'paints' new colourful compositions. Titled Canvas, the site-specific art piece deconstructs original video footage of life in Chicago's vibrant River North neighbourhood into a piece of art that is always evolving and stimulating to watch. The artist used custom-designed software, the installation enables locally-shot footage of scenes such as boats on the Chicago River and amusement rides on Navy Pier to dissolve into abstract patterns and then slowly sharpen back into footage specifically shot at 16 different locations. "The daily motion of Chicago ‘paints’ the pictures into place," describes Ed Purver, who was the lead designer and art director on the project. "Our custom software analyses each video for moving objects, so moments like a person walking, or a car driving become the ‘brushstrokes’ that slowly create each abstraction. As each video collides with the next, new compositions unfold in real time, literally creating thousands of possibilities in this one-of-a-kind evolving digital artwork." The piece of art is intentionally slow and meditative and is constantly on a visual journey of transition into abstraction and then back into figurative video imagery. Have a look at the video below to see the artwork in action.